Earlier this week we published Part 1 of an article from our partner ecomdash that explains how online businesses can use Twitter as part of their business growth strategy. Part 1 featured the first two recommendations for leveraging Twitter. Check out Part 2 below! As mentioned in Part 1 of this article, tweets should fall into one of four categories: Everyday, Campaigns, Reactive and Live. Below are the remaining two categories. 3. “Reactive” is your company responding to engagement on Twitter. Did a current customer or prospect tweet you with a question or concern? Eve Mayer, social media expert, suggests being incredibly transparent within these tweets. If your ecommerce business made a mistake, address it, apologize and own it. Or, maybe your fans tout you on Twitter. Respond! Thank them for reaching out, and let them know you appreciate their loyalty. Try to engage with as many of these tweets as possible. Remember, 40 percent of your tweets should fall under the interactive umbrella. Her dog, who had no brand affiliation moments before, is now her #PurinaDog. They were able to get a potential consumer to align with their brand without provocation. That is golden! 4. “Live” tweets can be tricky to master. You have to be engaged with what is happening in pop culture and ready to respond at a moment’s notice. Your company doesn’t have to be directly related to the topic, but you must add something to the dialogue, whether it’s humor, a witty observation or otherwise. Most often these are entertainment tweets, but they can be interactive or even calls-to-action, depending on how you frame it. 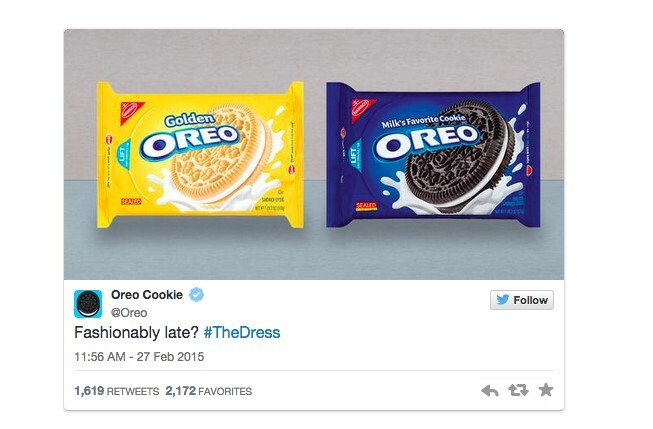 Example: Oreo was on its “A game” after the 2013 Super Bowl power outage, when it was the first brand to send out a tweet that commented on the blackout in a way that drove traffic back to their business. It’s clever, contributes to the conversation, and slips in the brand products in a way that doesn’t feel salesy or promotional. As far as “live” tweets go, it’s perfect. Now that you have the equation and detailed explanations of each Twitter category, go forth and conquer the Twittersphere. If you need help with your other social media platforms, read this post on mastering social banter on all your channels. For more ecommerce sales tips, sign up for the ecomdash blog here.